Today marks Google’s 15th birthday, which has prompted many users to reflect on what it was like to use the search engine circa 1998. We took the opportunity to look back at Americans’ habits to “Google themselves” during the first decade of the search engine’s life and found that, after an initial increase, the activity appears to have leveled off. In a survey conducted in April and May of 2013, we found that 56% of internet users have used a search engine to look up their own name to see what information is available about them online, up from 22% who had done that in 2001 (the first time we asked the question). Yet, despite significant increases in personal information sharing through social media and other channels, there has been little recent change in this activity. In 2009, 57% of internet users said they had searched for results connected to their name online. As we have found with many reputation-related activities online, adults under the age of 50 are more likely than older adults to monitor their digital footprints. 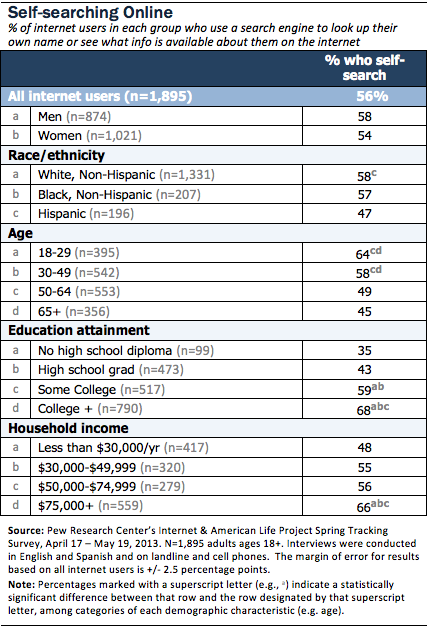 And those with higher levels of education and household income (who tend to have jobs that require online reputation monitoring) are among the most likely to self-search. Beyond using a search engine, 24% of internet users say they have used other websites or internet services—such as social media sites and directories–to look up their name to see what information is available about them online. That’s up only slightly from the 20% who reported doing so in 2009.